The Motorola DROID 4 is the fourth generation of Motorola's DROID line of QWERTY-equipped Android smartphones that are exclusive to the Verizon Wireless network in the US. It follows closely on from the DROID 3, and is more an evolutionary upgrade rather than a revolutionary new device. Usually each one of these DROID handsets also comes with a "Milestone" version for networks worldwide, although the last version (the Milestone 3) only had a limited release and was not available in Europe. Although the DROID 4 does look a little different from the DROID 3, most of the big changes are under the hood. The DROID 4 boosts the dual-core processor speed to 1.2GHz from 1.0GHz, doubles the RAM to 1GB from 512MB and the DROID 4 now supports LTE 4G data. Other features are pretty similar to the old one - there is a 4.0" 540 x 940 pixel display, an 8 megapixel camera on the back with 1080p HD video recording plus a 1.3 megapixel camera on the front for video calling. 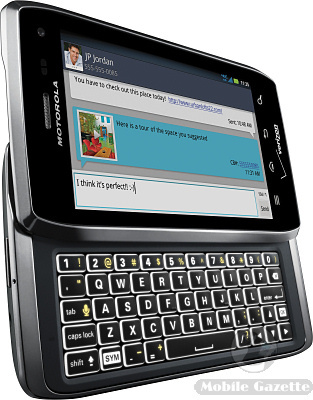 The slide-out QWERTY keyboard is quite large and still has a dedicated row of number keys, although with the DROID 4 the keys also glow in the dark. 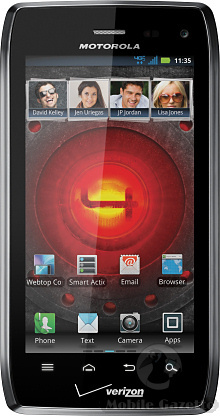 The DROID 4 has an FM radio, HDMI port, 16GB of internal flash memory plus a microSD slot, GPS and WiFi support. This is a CDMA handset with LTE, which means that the DROID 4 is not compatible with European cellular networks - although a possible Milestone 4 version presumably would be. This is an Android 2.3.5 device with some Motorola enhancements thrown in, and an update to Android 4.0 is promised for Q2 2012. The DROID 4 also supports on-device encryption, which should be more common in our view. There are a wide range of accessories available, including a couple of "Lapdock" docking stations and cradles. The DROID 4 measures 5.0 x 2.65 x 0.5 inches and weighs 6.31 ounces (approximately 127 x 67 x 13mm and 179 grams). The large 1785 mAh battery is quoted as giving up to 12.5 hours talktime and 8.5 days standby time. One other unusual feature is that the DROID 4 is also splash resistant. Motorola did not give any guidance on pricing, but we understand that the DROID 4 should be available in the next few weeks, and we would expect any announcement of a Milestone 4 variant to happen in the next few weeks also.